World Post Day is coming up! Blog > World Post Day is coming up! 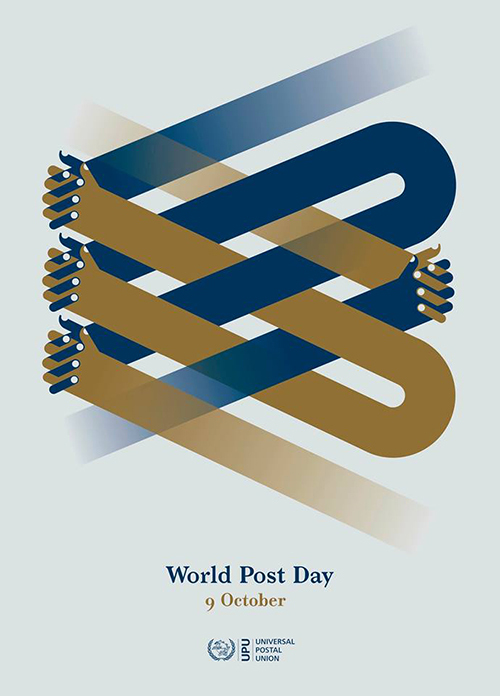 In a few days, the Universal Postal Union will celebrate its 144th anniversary, and this is also the day chosen to celebrate the Post all over the world. It’s a good day to reflect on the infrastructure that connects the globe in tangible ways, allowing things to move from our hands to the waiting hands of another person, no matter how far they are. Where would we be without all these efficient systems in place to make sure our postcards, letters and parcels arrive safely to their recipients? Fewer and fewer post offices seem to commemorate the date with each passing year… but don’t let it “rain on your (postal) parade”! We encourage everyone to join in and celebrate the day in any way they can. Send a few postcards with extra-nice stamps, high-five your mail carrier, or say a kind word to the person behind the counter at your post office, maybe bring some cookies, even! I’m sure your thoughtful gestures will all be appreciated. Hurray for the Post that brings us together! PS – If we’ve missed any events that you know of, just let us know in the comments and we’ll add it to the list. So proud to be a part of this amazing program for over a decade! Love to all! Special anniversary postcards have been designed which will be given for free in every Post office of Greece to celebrate the World Post Day. Also, in the capital of Greece, Athens, and particularly in five Metro stations, there will be special post booths where the people will be able to take and send aniversary postcards for free. Yeah, I can give my postmen a flower again! Each year on this day, I give my postmen a flower. They love it. - Yeah-! Canada Post has not done anything to celebrate the occasion or plan to. Last year I asked my mail carrier if he knew anything about it and he had no idea there was such a day. In fact, just the other day, the mail carriers and inside workers at Canada Post voted to go on strike. I'm hoping it won't happen. There is a night visit to the Postal Museum in Taiwan，there are singing and lottery activities.